Background : Rubella is a contagious viral infection associated with rash. 10-15% of women are susceptible to this infection in their childbearing years and the disease is usually transmitted to the developing fetus causing abortion or stillbirth or congenital Rubella syndrome (CRS). Sensorineural hearing loss is one of the most common abnormalities associated with CRS. Aims : The study was undertaken to determine the prevalence of Rubella induced congenital deafness in south India. Materials and Methods :The present study is carried out on 1076 hearing impaired children below 14 years of age to determine etiological factors for congenital hearing impairment. Various audiometric tests such as PTA, OAE and BERA were carried out to know the type and degree of hearing impairment. Development histories including the prenatal, perinatal and postnatal histories were collected using a standard questionnaire. Results :The results indicated very less percentage (1.57%) of cases with the history of maternal Rubella infection indicating a significant reduction of Rubella-induced deafness in the developing countries. Conclusions : The main reason behind the low percentage of children with rubella- induced hearing impairment may be due to appropriate immunization of mothers to the rubella infection during their child bearing years. The increasing awareness in the developing countries of this infection and its consequences is another important reason behind the low percentage of the affected population. Hearing loss is relatively common in human population and is caused by multiple etiological factors. Profound hearing loss is estimated to occur in one in 1000 live births. Approximately 50% of the cases are thought to be due to environmental factors (Prenatal, Perinatal or Postnatal factors) and the remaining are due to genetic factors or unknown causes. The prevalence of moderate to severe hearing impairment in India is about 6.3% implying about 630,567,000 hearing impaired in India alone. Out of these, the prevalence of adult onset hearing impairment is 7.6% and the childhood onset hearing impairment is 2%. Hearing Impairment can result from various etiological factors. One of the most important etiological factors for hearing loss is maternal Rubella. If the mother is affected with rubella during the first trimester of pregnancy, the chance of infection in the fetus is greater than 80%. Defects are rare if the infection occurs after the 20th week of pregnancy. Some studies suggest that rubella is widespread in Africa, central and south America and India., Congenital rubella occurred in an estimated 30,000 pregnancies in the United States causing congenital rubella syndrome in more than 20,000 cases in spite of the fact that more than 80% of the women were immune to Rubella. Majority of the children born with CRS are affected with sensorineural hearing loss and is the most common complication. Hearing loss present at birth is often not detected and may occur as a delayed manifestation of congenital rubella syndrome with late onset. The type of deafness resulting due to Rubella is most often profound or severe bilateral sensorineural hearing loss. Cataracts, mental retardation, microcephaly, congenital heart defects and other defects may also affect an infected fetus other than deafness. Sometimes a still birth or a miscarriage is also possible in the first or the second trimester of the pregnancy with rubella infection. Hence a study has been taken up to understand the role of maternal rubella infection in the causation of congenital hearing impairment. The study included 1076 children below 14 years of age with hearing impairment attending Government ENT hospital and schools for the deaf in and around Hyderabad. The clinical diagnosis of the patient was made after a detailed examination. Upon confirmation of hearing loss, audiometric evaluation was done using PTA, OAE and BERA to know the type and degree of hearing loss. Prenatal, perinatal and postnatal histories and the developmental history were collected from proband′s parents using a standard questionnaire in order to determine the etiological factors for the congenital hearing loss. The study was approved by the institutional ethical committee and the parents or guardians of the patients were informed about the study and their consent was obtained. The results indicated that in 74.07% (797) out of 1076 cases, environmental factors were involved in the causation of hearing loss. While in 8.83% (95) of the cases genetic factors were involved, the cause could not be established in rest of the cases (184/17.1%) [Table - 1]. In the majority (379/35.22%) of the cases, involvement of perinatal factors was observed followed by postnatal factors in 20.26% (218) and prenatal factors in 18.59% (200) of the cases with hearing impairment [Table - 2]. Among the prenatal factors the history of maternal rubella infection was reported in only 1.57% (17) of the cases. Among 17 children out of 1076 with the history of maternal rubella infection, 88.24% (15) children had severe sensorineural hearing impairment and 11.76% (2) of them had profound deafness [Table - 3]. 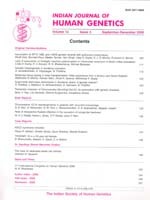 Most of the previous studies on the etiological factors for deafness indicated maternal rubella as a high risk prenatal factor causing congenital deafness.,, Studies carried out by Peckham et al in children with sensorineural deafness, observed 24% of the cases with congenital Rubella syndrome. Immunological studies carried out in Poland in seropositive women for rubella during first trimester of pregnancy showed the presence of IgG and IgM antibodies in them and in their fetus and hearing loss was confirmed in 50% of the children born to them. 198 hearing-impaired children and 200 controls were tested for rubella antibody IgG using ELISA in Bangladesh. The results showed 74% subjects and 18% controls with rubella antibody suggesting a high prevalence of rubella infection in Bangladesh and indicating implementation of vaccination against rubella infection. Studies on 75 children with deafness due to embryopathy from maternal rubella showed 15 cases with an interauricular auditory functional asymmetry, which is one of the elements of etiological diagnosis and which enables better adaptation of a hearing aid for rubella-induced deafness. In the current study, etiological factors were studied in 1076 hearing impaired children below 14 years of age. The results of the present study indicated only 1.57% children with rubella-induced deafness. This showed that rubella is not a high risk factor for congenital deafness in developing countries. The probable reason behind this could be the appropriate vaccination of the mothers with the rubella antigen during the pregnancy. Studies from Saudi Arabia also reported rubella syndrome to be an insignificant etiological factor for the causation of deafness. Etiological studies for hearing loss carried out in Australia from 1954-1975 showed smaller percentages of cases with rubella-induced hearing impairment. Most of the cases had mild to moderate hearing impairment and hardly any case with severe to profound loss was reported.,, In the present study, among 17 children with rubella-induced deafness, 15 (88.24%) children had severe hearing loss and 2 (11.76%) children had profound hearing loss [Table - 3]. Recent reports indicate that deafness due to intrauterine rubella infection was less compared to congenital hearing loss occurring due to CMV infections and alcohol fetopathia. Serological tests for rubella antibody in children with hearing impairment have been carried out in Iran to identify the cases with rubella-related deafness. Hemagglutination Inhibition (HI) test was carried out in 179 deaf children and 248 controls to establish the relationship between the maternal rubella and hearing impairment in Nigeria. Low titres of HI antibodies were observed in both the groups and absence of significant correlation between the state of hearing and HI antibody levels indicated that intrauterine rubella may not be an important cause of congenital deafness in Nigeria. However it is important that the rubella vaccination programme must be pursued more vigorously if this defect is to be prevented in the future. Proper care has to be taken by the mother during her childbearing years and during her gestation period in order to avoid any health problems. Most of the rubella infection cases go unnoticed by the mother as well as the doctors and hence awareness programmes must be pursued. Vaccination to all the mothers with the rubella antigen during their gestation period must be practiced regularly in all the developing countries, in order to prevent congenital rubella syndrome. Screening of the neonates before discharge should be implemented in all the hospitals to identify congenital hearing impairment at the earliest stage. We are grateful to the superintendent of the Govt. ENT hospital and principals of schools for the deaf for their kind cooperation in making this study possible. We are also highly indebted to the parents and the guardians of the patients for their support, information and valuable time given to us.